Big data? No. Just a little data about water for the poor. Finally. Software is eating the world, as the data at our fingertips (literally) gets richer all the time. Smart phones, Google searches, maps, weather, music from Pandora or Songza, Uber and AirBnb are all data-driven. Baseball nerds like me look at WAR, OPS and WHIP, along with batting average and ERA. But water? Not so much. The water sector in the developing world is stuck somewhere in the mid-20th century. Where are the water sources in the global south? Do they function? How’s the quality? These are questions of life and death–and no one has answers. The Water Point Data Exchange (WPDx) is a new initiative aimed at coming up with answers. A global platform for sharing water point data, WPDx was released in May by the Global Water Challenge, a coalition of businesses and NGOs, along with a working group of prominent partners including the World Bank, UNICEF and World Vision. Sharing data which is now kept on paper, stored on private servers or disaggregated has “the potential to improve water access for millions of people as a result of better information available to governments, service providers, researchers, NGOs, and others,” says the WPDx. True enough, but potential is the key word. The water sector desperately needs fixing, as I wrote last spring in Water Taps and Information Gaps. Projects get built, and pretty photos are uploaded to websites, but not long after the charities that built the wells or taps don’t know if they are still working. Many break, and are never repaired. If community members contribute time, energy or cash to a water project that fails, they are left worse off. Improve International, an NGO formed to promote sustainability in the sector, says “40% of water and sanitation projects fail within a few years of implementation.” That might be an exaggeration, but not by a lot. The good news is that the major players in the WASH (water, sanitation and hygiene) sector, including such high-profile fund-raising juggernauts as water.org and charity: water, are at last taking meaningful steps to track the sustainability of their projects, and some have pledged to work with the WPDx. Banks tells me that WPDx has aggregated data on nearly 250,000 water points in 25 countries from 30 sources. Those that have shared the most data are the ministry of water and environment of Uganda (97,000 water points), DACAAR, a consortium of Danish NGOs working in Afghanistan (59,000), the government of Sierra Leone (28,000) and WASH Liberia, a government agency (nearly 10,000). This data existed before WPDx came along but it was siloed, making comparisons difficult. “The notion that data should be shared in the water sector has been kicking around for a while,” Banks says, but previous efforts, including a UN-Google.org project launched in 2010, failed to get broad buy-in. To cast as wide a net as possible, WPDx for now requires only very basic information: where’s the water source, where does the water come from, is it functioning, who collected the data and when was it collected. Other data points remain optional. “It’s the biggest, best data we’ve got, but it’s still quirky and imperfect,” Banks admits. The data base is available for download, but only as a big Excel file, a format that is less than user-friendly. (Compare WPDx with the World Resources Institute’s Global Forest Watch, an analogous effort to use data to address an environmental or health issue.) WPDx is developing software that will allow easier exploration and customization of data. Better water data can help governments and NGOs to allocate resources where the needs are greatest; it can enable citizens to hold governments accountable, and donors to keep tabs on NGOs. “It will help with our advocacy,” says John Oldfield, the CEO of WASH Advocates, which works to build support for clean water and sanitation in the US and around the world. Over time, governments and NGOs should be able to learn what types of equipment and governance structures perform best. One can even imagine governments and NGOs soliciting feedback from the poor people they are trying to serve. The encouraging news is that technology could bring dramatically more transparency to the sector. Remote sensors to collect water point data have enormous potential. Google and charity: water have been working since 2012 to develop sensor technology, and they’re making headway. Caddisfly is a low cost, open-source water testing kit that works with a mobile phone. Data, by itself, won’t solve the problems plaguing the WASH sector. But without data, those problems won’t be solved. 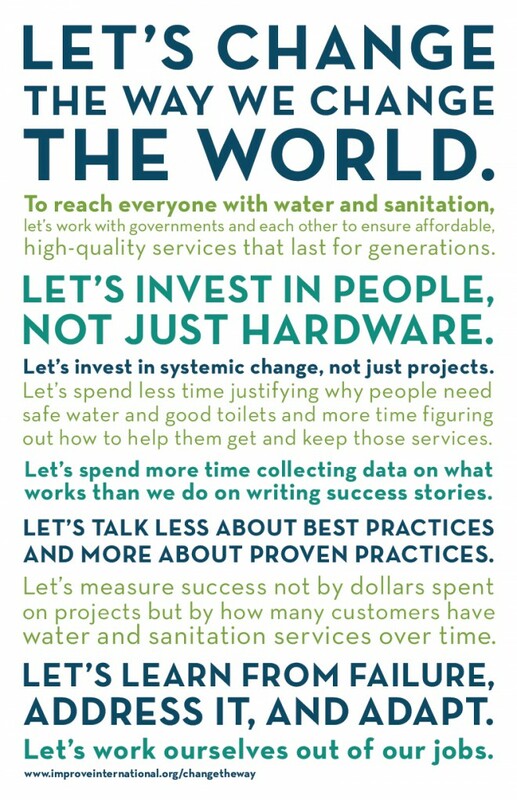 See below for a “manifesto” from Improve International that points the way towards a sustainable water sector.